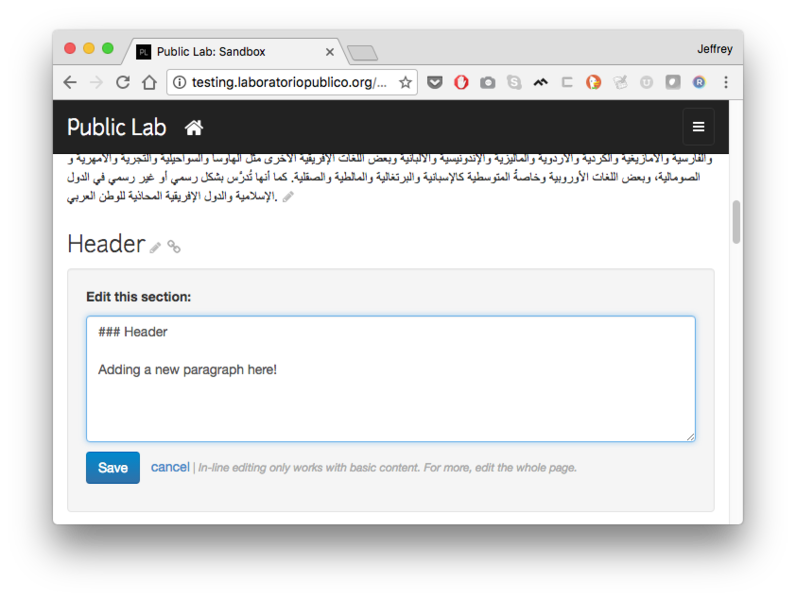 I've been working on this part of the Rich Wikis project to make PublicLab.org's wikis more interactive -- to encourage people to author more -- and one part of that has been the "Editable sub-sections" feature. To make editing wikis easier, we're interested in making it possible to edit just one section; sections could be divided as block elements, so any header, paragraph, list, blockquote, or image would become a subsection. Subsections could have an "edit" link next to them, which opens an inline editor for just that subsection. You can open a section for editing by pressing the "pencil" icon at the end of an editable section. For now it's Markdown, but we'll get a rich text editor in there soon. Have fun, and feedback/input very welcome!